Touted on the interwebz as some of the best seafood Galveston has to offer, Miller’s Seawall Grill was our first choice for dinner the night we arrived in Galveston, Texas. In reality, that had nothing to do with why we chose to eat here. It was just the closest restaurant to our hotel and within walking distance. We were tired, hungry, annoyed, exhausted, and possibly sick. We flew an insane route from SLC-HOU passing through LGB and BOS along the way, excluding a 45 minute Lyft ride from the airport. On the third leg of our flight, two out of our three kids started throwing up whether from something they ate or motion sickness, we’re not sure, but it was miserable for everyone on the plane – no matter what the reason. 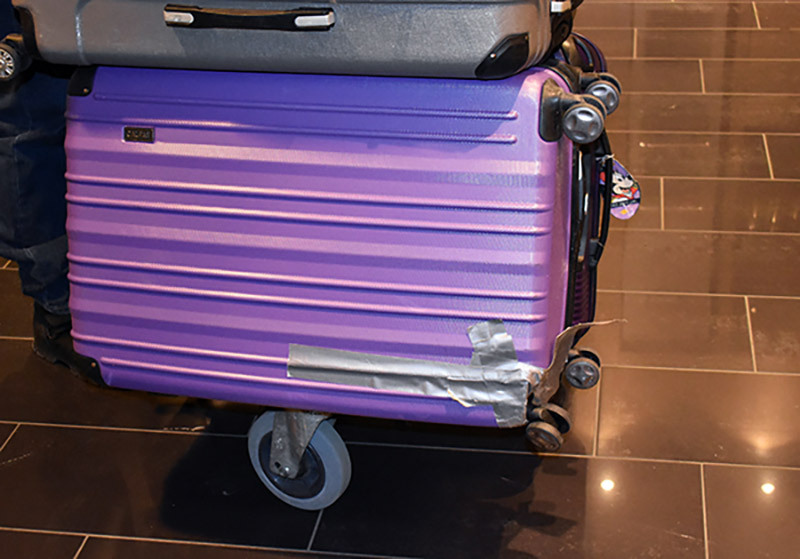 I accidentally left my phone charging at the gate we landed and had to race back through security to retrieve it, one of our brand new bags of luggage was cracked in two places along the bottom where the wheels connect, and it was just day one of our 22 day adventure for Christmas 2017. That’s why we pack duct tape right? Whether we dined at Miller’s Seawall Grill out of convenience or desperation, it was an excellent choice. We ate some of the best fish tacos we’ve ever had and the desserts were plentiful and a welcome ending to a very rough 24 hours. Located on Seawall Boulevard with majestic views of the ocean, Miller’s Seawall Grill is a small quaint little restaurant where everything is made of wood. The entrance is cozy with a little festive Christmas tree, poinsettias, and relaxed lighting throughout. 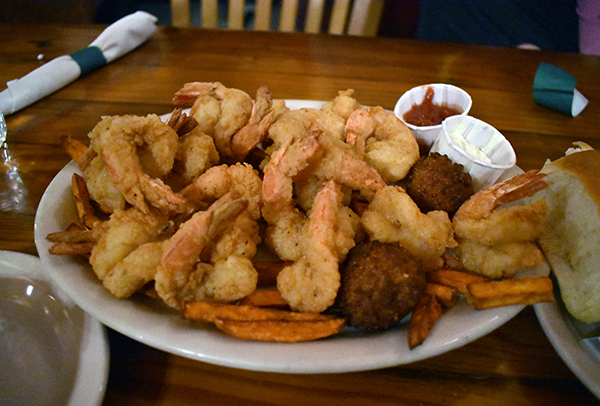 Miller’s Seawall Grill has a homey vibe with friendly staff and food cooked to order. With the exception of the salmon and the snapper all the fish is caught locally. 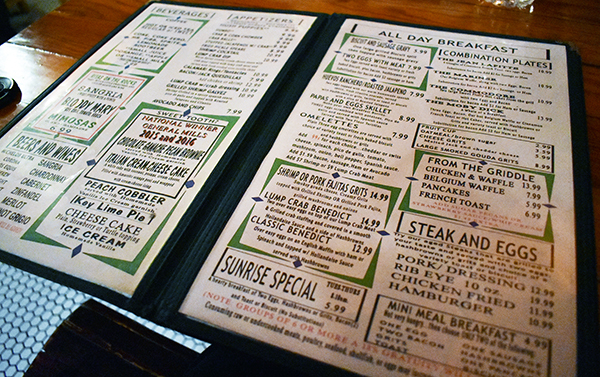 Miller’s Seawall Grill serves both breakfast and dinner. While their breakfast is famous, particularly their shrimp and grits, and served all day, we opted for dinner selections. We were desperate for some real food. The menu consists of mostly seafood fare in every imaginable variety and a few pork and beef dishes mixed in; fried or grilled seafood with chips, po-boys, and lots of shrimp, crab and chowder. We ordered the 16, fish and chips and the fish tacos. They were all excellent, but the fish tacos were literally the best fish tacos we’ve ever had. They came with our choice of a side dish, slightly sweet coleslaw and a perfectly spiced and blended baja sauce. This sauce is what made these fish tacos so good. The spices in the sauce accompanied the perfectly cooked fish and balanced the coleslaw in just the right proportions. The tacos come wrapped in foil to keep them warm, and no picture can capture their abundant flavor. The fish and chips came with two large pieces of flounder, and was just the right size for our three kids to share. We loved the option of substituting sweet potato fries or au gratin potatoes with their meal, and in fact we ordered both. The 16 came with our choice of 16 pieces of medium sized grilled or fried shrimp – we chose fried, hush puppies and we opted for fried okra for our side dish. The shrimp was perfection. The batter was a thin coating, the shrimp was buttery and still chewy, and the accompanying cocktail and tartar sauce was more savory than sweet. For dessert we were compelled by the fact that Miller’s Seawall Grill has two national award winning desserts and we definitely weren’t going to pass up the opportunity to try both. 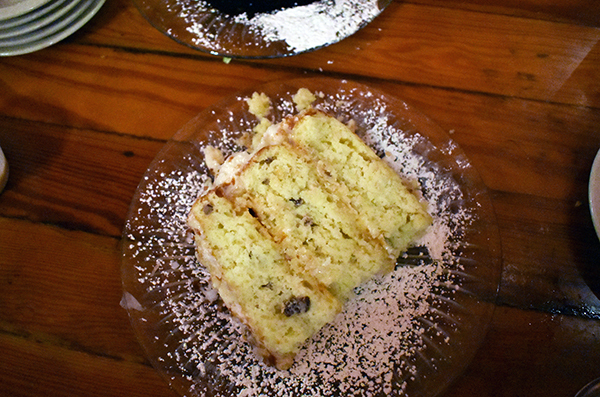 The Italian Cream Cake was a mix of coconut, vanilla and pineapple flavored cake. There wasn’t too much frosting, but enough to compliment the cake layers. It was a huge slice! The kind you serve yourself when you are home alone and the kids are in bed. It was soft and fluffy and smooth and decadent. As good as the Italian Cream Cake was, the Pecan Chocolate Brownie served with Chocolate Ganache was even better (shown above). This dessert is a mix between chocolate cake and a chocolate brownie, stacked as thick as a double layered cake and covered with a warm layer of dripping chocolate ganache and pecans. When you are craving chocolate, this is what you are craving. Served with a generous scoop of vanilla ice cream, this was the ultimate ending to a delicious meal. 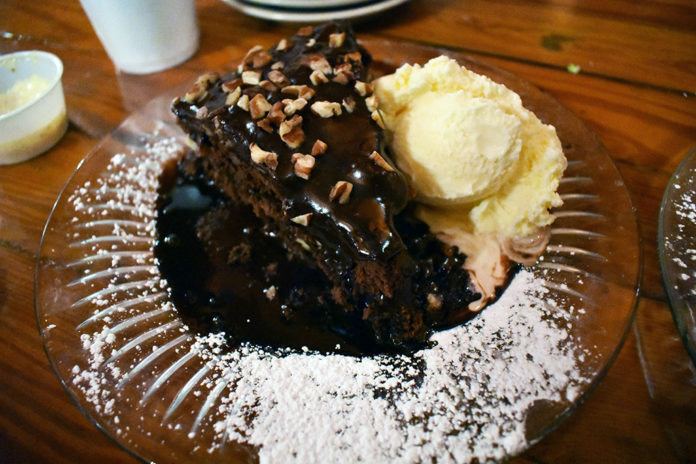 We will come back here time and again, even if it’s just for the chocolate brownie. In fact, I will fly SLC-LGB-BOS-HOU just for that brownie, if that’s what it takes. ► For Kids: Down home earthy establishment in the heart of Galveston. Kids are welcome and will feel welcome. There is a kids menu, though we have found sharing an adult meal offers more for a smaller price tag. 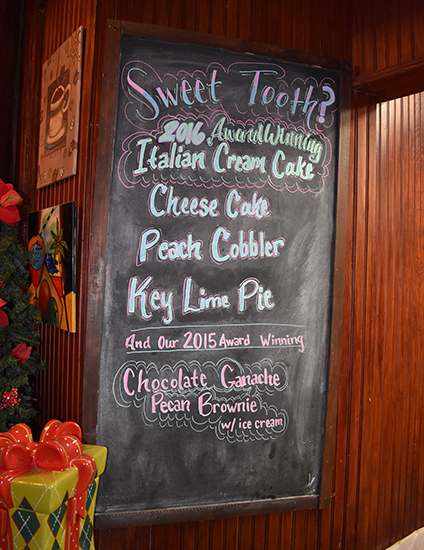 From dinner to dessert, Miller’s Seawall Grill has something to please all palates. Where is your favorite place to eat in Galveston? 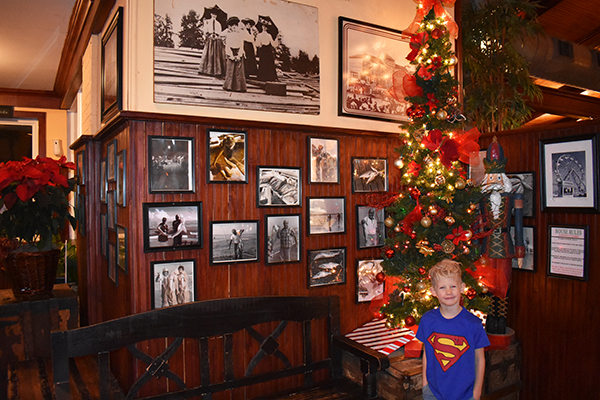 Check out our review of Fish Tales, across from Pleasure Pier in Galveston. Though we didn’t have time to hit up Cajun Greek, it was excitedly recommended to us by a fellow traveler and Galveston born man who was celebrating his birthday when we bumped into him! 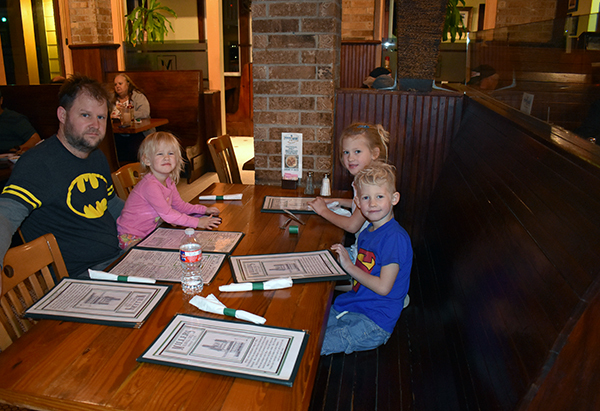 ► Nap-Time Version: #cleandiaper family restaurant review of Miller’s Seawall Grill in Galveston, Texas where everyone left full, satisfied and yet still wanting more. Galveston is a fun historic town where many cruises port in and out of, but unless it’s the weekend – not much is open. We settled here for a few days prior to cruising on the Disney Wonder!